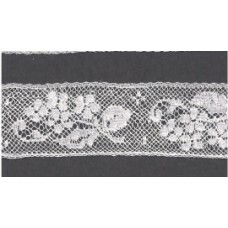 We carry a wide variety of French lace for all your Heirloom sewing needs. French Leavers laces carry a point designation. Stated simply, the higher the point assignment of the lace, the finer the lace. We carry both Valencienne (Val or round thread) and Maline Laces. Our Maline laces are 15 points and our Val laces are 12 and 14 points. We do not carry any lace less than 12 points. While Antique laces were produced with 100% cotton thread, better quality control was attained during the second half of the 20th century with the addition of 10% nylon. Hence today, all French "cotton" laces are 90% cotton and 10% nylon. There are many styles, sizes and colours, other than what is listed, available on request. 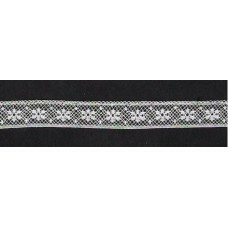 18mm Embroidered Entredeux/Beading insertion- Floral - White. Priced by the metre. ..
Entredeaux - Available in White, Ivory and Ecru. Priced by the metre. ..
6mm Faggott (Wide Entredeaux) - Available in White, Ecru and Ivory. Priced by the metre. ..
10mm Insertion - White. Available in Ecru on request. Priced by the metre. ..
15mm Edging - White. Available in Ecru on request. Priced by the metre. ..
20mm Edging - Champagne. Available in White on request. Priced by the metre. ..
20mm Insertion - Champagne. Available in White on request. Priced by the metre. ..
10mm Beading - White. Available in Ecru and Ivory on request. Priced by the metre. ..
10mm Beading - Champagne. Priced by the metre. ..
12mm Edging - Floral - White. Priced by the metre. ..
20mm Edging - Floral - White. Priced by the metre. ..
20mm wide Insertion in White. Priced by the metre. ..
25mm wide insertion in White. Priced by the metre. ..
15mm Edging - white. Priced by the metre. ..
20mm Edging - Bow - White. Priced by the metre. ..
15mm Insertion - Floral Bow- White. Priced by the metre. ..
20mm Floral Edging - white. Priced by the metre. 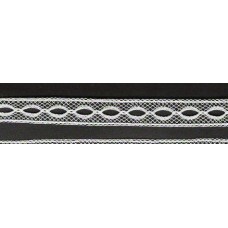 ..
40mm Floral Edging in White. Priced by the metre. ..
15mm Edging - Champagne. Priced by the metre. ..
25mm Edging - Ecru. Priced by the metre. ..
35mm Edging - Champagne. Priced by the metre. ..